This cold bean salad tastes as good as it looks! That just leaves buying the canned beans and corn, bell peppers, and red onion. Start by rinsing and draining all the beans and the canned corn in a colander. Then chop the red and green bell peppers, and mince the red onion. (My Vegetable and Dip video will show you how to cut and clean the peppers. Once they are cut into strips, it is just a matter of then lining them up and chopping them up. Mix together the beans, corn, chopped peppers, and minced onions in a large bowl. Notice how I used one measuring cup to measure both the oil and vinegar together. Saves on clean-up! Be sure to use fresh lemon juice. You will only need about 1 teaspoon of fresh crushed garlic. 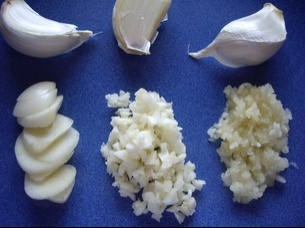 The photo below shows all the dressing ingredients whisked together. Feel free to add a few drops of hot sauce if you like. Now pour the dressing over the bean mixture. Cilantro is another optional ingredient, often found in Tex-Mex dishes. If you like cilantro, add 1/4 cup – minced to the salad. (You can wash and chop it as you would parsley.) Cilantro has a very distinctive flavor and aroma which people either love or hate! 1/4 cup of chopped cilantro is just enough. A great substitution for cilantro is actually a combination of parsley and mint. You may be thinking there is way too much dressing for this salad. However, the bean salad needs to marinate in the dressing for a couple of hours (in the refrigerator) for all the flavors to meld together. Be sure to cover this salad with plastic wrap and let it chill completely before serving. If there are any leftovers, drain off the excess dressing and store the bean salad in the refrigerator. It will keep for about two days! Tried the bean-salad-tex-mex today…ABSOLUTELY LOVED IT!…..For people who like pomegranate…goes very well with the salad. Wow! I would never have even thought of adding pomegranate seeds to this recipe! I’ll keep it in mind next time I make this salad.